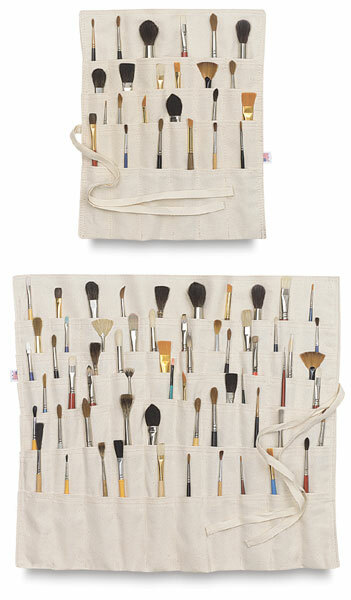 If you like to keep a lot of brushes on hand, you need the 60-pocket Brush Organizer! No matter how many brushes you own, you can roll them up and store them with ease in this spacious, 22" × 18" (56 cm × 46 cm) organizer. Each pocket is 1½" (38 mm) wide, and depending on your brush size, can hold one large or three or four small brushes. It's made of heavy-duty, natural-cotton canvas, durably stitched, with two long canvas ties. 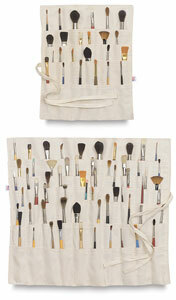 Canvas Brush Organizer Junior — A smaller version of the organizer, it measures 12½" × 12" (30 cm × 12 cm) with 24 pockets.